You know how I like to ramble. And what better subject to ramble on than my favorite TV shows. TV Ramblings may be a new feature here at The Bucket List. I thought long and hard about what direction I want to take this site. The Bucket List is all about books all the time, but sometimes I want to ramble about other things too. I have decided that Wednesday, instead of participating in memes, my television will be making the calls. 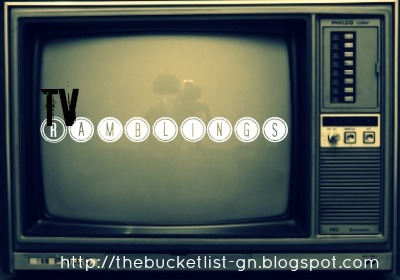 On Wednesdays, The Bucket List will be open to ramblings about my favorite TV shows and yours. Today, I miss Cas more than usual and I thought I would ramble about the many faces that this angel, I love, has. The new season is starting up and where we left off in season 7 of Supernatural didn't make Castiel look like such a good guy. Well even though he may play many different roles or faces, I still love him through each one. Hey, and what are the odds is seeing one of these faces again in this upcoming season. What face do you think Castiel will have on for season 8? And one more thing: this is the first post that I have ever tried to use gifs. What do you think or is it too distracting? All of the gifs used, I found on Tumblr, go check it out. This is the face that everyone remembers because no matter what face he uses, Castiel is always an angel. Maybe not literally (especially that episode with the Pizza Man), but figuratively, he is always an angel. I really miss seeing his wings and beautiful eye stare-downs. This is the traditional Cas that we all know and love. Oh, Cas. It's the end of the world, the angel got thirsty. This was so cute and hilarious because seeing our favorite angel drunk put a new spin on things. I remember this episode just because of Castiel's hair. Where is his comb or razor? He looked so different that it took me by surprise. I remember right after these girls walk out, Dean goes, "Are you stoned?" Cas: "Generally, yes." Well, something like that. I had to pick my jaw up off the floor. Where's my angel? I couldn't find any good gifs for Cas being God, but this is a pretty good one. All I can say is: at least, he shaved. This episode is The French Mistake, which might be one of my favorite episodes of Supernatural. Now think about this. This is Misha Collins, who usually plays Castiel in the show, is really playing himself as a character but Sam and Dean think he is Castiel. Confusing? Isn't that whole episode? It is so great. Just the idea of Castiel eating hundreds of hamburgers makes me happy. It was so random and still so awesome. Castiel/Jimmy has a craving for hamburgers. Who knew? Castiel being taking over the Leviathans might have taken about five minutes long. That is how long this face lasted, but it was one of my favorites. Not because it shows how awesome Cas is, but because it shows how awesome Misha can act. I realized in this moment that Misha can play a really good guy and a really really bad guy. Plus, whoever did the tree-veins on his neck should get an award because all the blood on Cas was so creative. I miss Jimmy. We don't really get enough of him and I think we should. At times, I sometimes forget that Castiel is using Jimmy's body to be on earth. See, so Cas is not even wearing his real face. I wasn't sure what else to call him. Lately this is all I have seen of my wonderful Castiel. This one likes to be unhelpful unless you want to play a board game with him. As much as I would love to play Twister or Sorry with my favorite angel, I don't want to play games when Sam and Dean are in the middle of something. My husband is obsessed with Supernatural ... I have yet to watch it! But plan on it very soon!! Misha face is my favorite, he is just so cute!! He wants to be a part of J2, one of the gang, but he isn't. Poor Misha face. . .